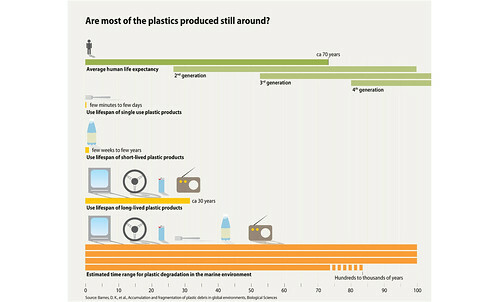 Graphic Marine Litter Vit... Are most of the plastics produced still around? Marine litter (or debris) is waste created by humans that has been discharged into the coastal or marine environment. It is defined as “any anthropogenic, manufactured, or processed solid material (regardless of size) discarded, disposed of, or abandoned in the environment, including all materials discarded into the sea, on the shore, or brought indirectly to the sea by rivers, sewage, storm water, waves, or winds” (UNEP and NOAA, 2012). Just as human activities are varied and widespread, so are the sources of litter. The sources may be located directly at sea, on the coast or further inland. Litter can be transported over long distances and into all marine habitats – from the surf zone all the way to remote mid-oceanic gyres and the deep sea floor. Like other pollutants, marine litter affects habitats, ecological function and the health of organisms of the ecosystems where it accumulates.